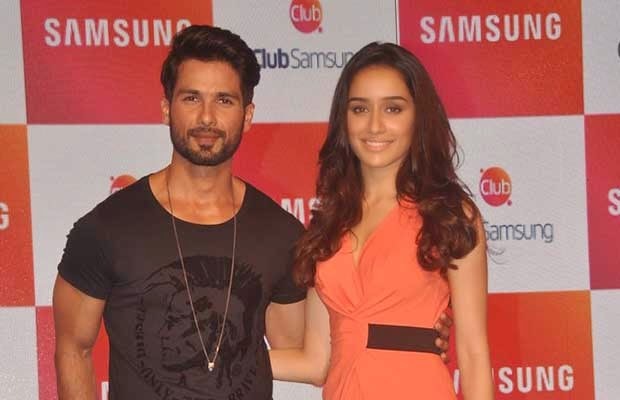 Shahid Kapoor and Shraddha Kapoor were spotted promoting their movie ‘Haider‘ at the launch of Club Samsung. While Shraddha Kapoor chose to wear an orange dress, Shahid Kapoor wore a black attire; black shirt and jeans and a long chain. Shraddha looked hot and Shahid looked cool. Famous singer duo Sajid- Wajid were also seen performing an act with comedian Cyrus Broacha. Haider releasing alongside ‘Bang Bang‘ on October 2, both are predicted to be a good film. Haider, directed by Vishal Bhardwaj and co-written by Bharadwaj and Basharat Peer, is a modern-day adaptation of William Shakespeare‘s Hamlet, set in Kashmir. The film stars Shahid Kapoor as Haider, Tabu as his mother and Shraddha Kapoor as Arshia, a journalist by profession and Haider’s love-interest.